This adaptation provides an accelerator pedal to either the right of the brake pedal (as usual) or to the left of the brake pedal. The pedal to be used should be pulled into position and in doing so the pedal not being used will flip up against the bulkhead out of the way. 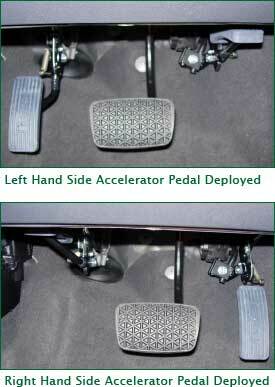 The left foot accelerator consists of two hinged pedals connected by a cable. It will have been set up in such a way as to ensure it is only possible to have one of the pedals down at any time. To deploy the required pedal simply pull it down into position and the other pedal will flip up out of the way. We would recommend that anyone considering driving with a left foot accelerator for the first time should consider first having a driving assessment or lessons with a qualified instructor using a left foot accelerator. A register of instructors is kept by the Queen Elizabeth Foundation (Telephone 020 8770 1151).